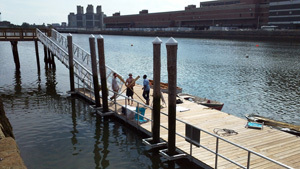 Fort Point Pier - Boston's new public dock with Harbor access for kayak — SIK, SOT and SUP. To view events at Fort Point Pier, plus news and videos, click here. For a list of docks in Fort Point Channel, visit Friends of Fort Point Channel. offered by Hull Lifesaving Museum. 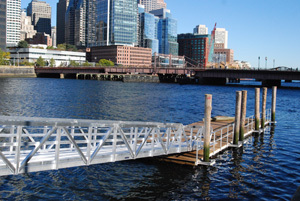 Welcome to fortpointpier.com, information and inside tips on planning a kayak launch from Fort Point Pier and floating dock (now owned by General Electric) downtown Boston's public launchpoint for non-motorized watercraft. "Park-n-paddle" is the best phrase we have to describe Fort Point Pier. Fort Point Pier is, according to our data, the only public kayak/canoe/SUP/SOT launch in any U.S. major metropolitan downtown with car parking at the dock. Click here to begin planning a visit, with info on parking, portage, regulations, water quality, history and more. We'll be expanding this site to include event listings, video tours and points of interest along Boston Harbor culled from our 20+ years of history living, boating, paddling and fishing in Boston waters. Fort Point Pier is located in the historic Fort Point neighborhood of South Boston, just south of the Summer Street Bridge along the Harborwalk on the Fort Point Channel. including parking, portage & launch. With its broad floating dock having a planked deck surface only 12.5" inches above the waterline, generous in cleats and other potential tie-up points, Fort Point Pier is perfectly suited as a FREE, public launch point to Boston Harbor for kayak, stand-up paddle board (SUP), sit-on-top (SOT), rowboat, scull, surf ski and windsurfer/sailboard. The pier offers all amenities necessary for easy onshore parking, pickup, drop-off, put-in and portage of a kayak or similarly lightweight watercraft. Fort Point Channel is a waterway of generally calm basins, amenable to a range of skill levels. View our narrated video tour (roughcut), including some discussion of area history and architecture, starting at Fort Point Pier and illustrating typical conditions in the Channel basins and entrance to Boston Harbor. From the water, accessible waypoints with dock or shoreline access include downtown Boston, South Boston Waterfront (aka Seaport District aka Innovation District), Castle Island, Pleasure Bay, Carson Beach, the Boston Harbor Islands, East Boston, Deer Island, points north including Charlestown, the Mystic River and beyond. Paddlers of moderate skill level may consider a transit from Fort Point Pier to the Charles River. Along the way, sights include architecture (Pei, Johnson, Cobb, et al.,) history (Customs Tower, U.S.S. Constitution / Old Ironsides, Bunker Hill Monument, etc.) and many interesting quirks of Boston's shoreline. Beyond PFD and navlight, a sprayskirt and airhorn are recommended. This route requires careful navigation among powerboats and sailboats, through active mooring bays, past active high-speed ferry docks, in the wake of larger tour boats. Experienced paddlers can pass through locks to enter the Charles River for access points west including public docks and shores at the Esplanade, Hatch Shell, Lechmere/Galleria Mall, Back Bay, Boston University, Museum of Science, MIT, Harvard Square, and great public docks along the Boston side of Soldier's Field Road. Paddlers with at least moderate sea kayak experience may transit east from the mouth of Fort Point Channel, passing Fan Pier, the ICA and Castle Island in South Boston. For those skill and endurance, this route leads to Boston Harbor and the Boston Harbor Islands. While Fort Point Channel is generally calm, Boston's Inner Harbor and the Harbor itself presents a wide range of challenges including wind, wakes, currents, choppy seas, lots of boats, rocky shores and steep seawalls. Although the Inner Harbor can be glassy and calm, conditions are highly unpredictable and ill-suited for paddlers with little sea kayaking experience. Click here to view a 30-second video snapshot of conditions at the mouth of the Inner Harbor near Logan Airport on a summer Saturday afternoon. Temperament of seas varies based on wind, tides and boat traffic. The Inner Harbor has no sandy shores. Fort Point Pier is a world-class launch point for expedition sea kayakers interested in exploring coastal New England. Given its close proximity to Boston's historic sites, art galleries, restaurants, theater, movies, hotels and clubs, along with its own convenient portage and affordable long-term parking, Fort Point Pier is unparalleled as an exciting waypoint for multi-day kayak excursions. For paddlers interested in some time ashore, the dock at Fort Point Pier is conveniently located in the historic Fort Point neighborhood, a walkable neighborhood sprinkled with esoteric retail shops, restaurants, bakeries and cafés. Where is the best place to put in a kayak on Boston Harbor? Where can I launch a kayak in Boston Harbor? Where is a public dock on Boston Harbor? Where can I learn to paddle a kayak in Boston Harbor? Where can I launch a stand-up paddle board in Boston Harbor? Best kayak fishing in downtown Boston? Downtown Boston kayak put-in locations? Is there a boat launch in downtown Boston? Where is Boston Harbor kayaking? Sea kayak in Boston Harbor? Click here for information on planning a visit to Fort Point Pier. Questions, corrections or comments? Contact us here.Google SEO Keywords: Fort Point Channel dock, kayak, kayaking, paddlesports, stand-up paddling, paddle boarding, paddle board surfing, sit-on-top kayaking, surfski, dock, Boston Wharf, Boston Harbour, Fort Point Channel, 100 Acre Plan, Fort Point Historic District, Innovation District, IDBoston, Boston Seaport, Boston Harbor, Georges Island, Bumpkin Island, Grape Island, Thompson Island, Gallops Island, Fort Andrews, Peddocks Island, Boston Lighthouse, Sail Boston, Tall Ships, USS Constitution, Boston Tea Party Museum, Tea Party Ship, Gillette World Shaving Headquarters, Rowes Wharf, Long Wharf, Intercontinental Hotel, Russia Wharf, Atlantic Wharf, Independence Wharf, Friends of Fort Point Channel, Friends of Fan Pier, Channel Center, Barking Crab, Fort Point Arts Community, Institute for Contemporary Art, ICA, Pier IV, World Trade Center, Seaport Square© 2019 All rights reserved.